Green Goddess fire engines could have reached the end of the road, as the government says they are not needed. Forty of the Bedford vehicles, based in Marchington, Staffordshire, and built in the 1950s, are to be auctioned. The engines became famous in the fire strikes of 1977 and more recently in the firefighters' dispute of 2002-2003. The country's entire fleet of 1,000 engines could be sold off if the sale, organised by Witham Specialist Vehicles of Colsterworth, Lincs, is a success. The 40 engines go on sale from 21 February. The Green Goddesses were used by the armed forces to cover for striking crews. 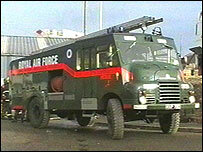 But new arrangements put in place since the last fire strike mean that in the event of future industrial action, the military crews should have access to a reserve of modern red fire engines. Fire and Rescue Service Minister Nick Raynsford said: "The Green Goddess fleet has served us well in emergencies but with now being able to use modern fire appliances as part of our contingency planning arrangements, we are looking at its future. "The sale of these 40 vehicles is part of this process and is essentially to test the market. "No decisions have yet been made on the remaining fleet though we are looking at all options." The Green Goddesses were built in the 1950s to equip the Auxiliary Fire Service (AFS), a civilian volunteer force created to fight fires and pump water in the event of a nuclear attack on Britain. After the AFS was disbanded in 1968, the fire engines were put into storage for use in emergencies such as flooding or strikes. A spokeswoman for the Office of the Deputy Prime Minister said Green Goddesses would no longer be needed in the event of strikes. "Under recent fire legislation the Secretary of State has powers to make available red engines in the event of a fire strike in the interests of public safety," she said. "What that does not mean, however, is picket lines having to be crossed. "It means the fire and rescue authorities have to make provision and provide red engines for fire cover. "It will mean they have reserve stocks of their own."